The temperature may be a few degrees higher for a little bit longer each day. The sun is in the sky longer. The ground gives a bit underfoot, and the wet soil has a certain aroma that is unmistakable. Tips of crocuses are revealing themselves. Some are fully open. The buds on some trees are fatter than they were two weeks ago. Sound carries differently. Snow banks are nearly gone, and don't absorb the voices of the kids waiting at the bus stop in the morning anymore. Giggles, and Bye, Mom's are heard clearer, and louder than in January. The cloud ceiling isn't as low. Sound isn't muffled anymore beneath low gray clouds, but floats up, and beyond the neighborhood now. We begin to take our time outside. We don't rush to the trash barrel as we did four weeks ago. We saunter. We may even pause along the way, and listen. We will take a deep breath in, smell the dirt, and reach over to feel just how fat the lilac buds have become. Open the back door, go outside. Feel it. 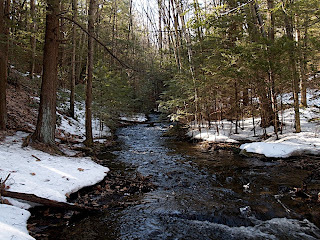 Photo: Stream on the Leadmine Mountain land. :) I enjoy your posts.